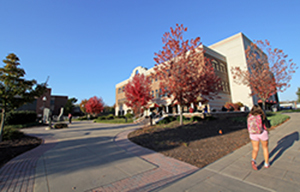 The Interdisciplinary Major university studies track will benefit students whose undergraduate studies have been delayed or interrupted due to exceptional circumstances, experienced learners (e.g., transfer students who enter Bloomsburg University with 60 credits), and non-traditional students who are returning to college for personal growth or career advancement. Students will complete an application to the University Studies track and select a faculty advisor. Students and their faculty advisors will devise a program of study and mutually agree upon a faculty advisor to serve as the chairperson of the Faculty Advisory Board. Students will be required to meet with their faculty advisor prior to registering for courses during each semester of their enrollment in this program. The faculty advisor will supervise the development of the student’s portfolio throughout the student’s enrollment in the program. Applications will be submitted to the Director of the Interdisciplinary Studies Major. You should identify an advisor from within one of the academic disciplines represented in your proposed degree and work with them to complete the application. You then submit the application to the Director of the Interdisciplinary Major. There will be Fall and Spring deadlines approximately halfway through each semester. These deadlines will allow the Director of the Interdisciplinary Major to review applications for the University Studies track before students begin scheduling for the next semester. What happens if an application is denied? An application for the University Studies track may be denied if a student’s academic needs can be met through an existing major or the application lacks sufficient detail. In the event that a student’s application is denied, that student will receive feedback and redirection from the Director of the Interdisciplinary Major. When may students apply for the University Studies track? Students typically will apply for the University Studies track after exploring degree programs in established disciplines (i.e., after completing a minimum of 75 credits but fewer than 90 credits). May students who are accepted into the University Studies track pursue a double major? No. Students enrolled in the University Studies track may not declare a second undergraduate major at Bloomsburg University. What is the integrative senior capstone service project? The integrative senior capstone service project is a culminating educational experience that will challenge students to use the knowledge, skills, and experiences that they gained from divergent courses to identify and address a multi-faceted “real world” issue, challenge, or problem related to their program of study. Students will consult with staff in the SOLVE Office of Community Service and Employment, Center for Community Research and Consulting, or other campus advisor to ascertain opportunities for community outreach and volunteerism. This experiential learning project will afford students the opportunity to begin transitioning from school to a career. Drawing upon past learning, students will apply their scholarship in service to others while developing a sense of professionalism and collaborating on a meaningful project with individuals already in the field. Through the vehicle of Independent Study, a faculty advisor will supervise the senior capstone service project. The project will culminate in an integrative portfolio (electronic or otherwise). The portfolio will be evaluated by the student’s faculty advisor using a value rubric.